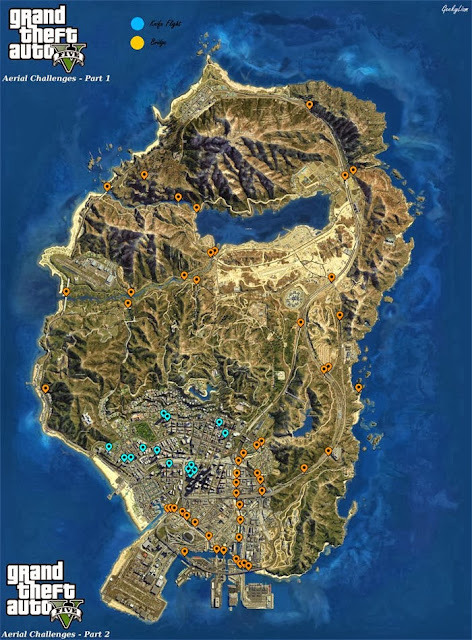 In GTA V, there are a total of 15 knife flight aerial challenges. Completing all of them is required for the "Close Shave" achievement / trophy and counts towards 100% game completion. First off, get a fighter jet from Ford Zancudo. (Video) There are many ways to get into the military base as well. You can complete all 15 Knife Flights with it. Alternatively, you can also try to get a stunt airplane. They land at the airport in the desert from time to time. To learn how Knife Flights work you should visit the Flight School at Los Santos Airport. You might also want to max out the "Flying" statistic of one of your characters to have more control over your aircraft. If your jet gets massively damaged, you can use the quick save and immediately reload the game. It will automatically be repaired when loading the save game. Also make use of quick save before attempting the harder Knife Flight Stunts. Below you will find a map of the locations, and below that there is a video showing how to get the knife flights. Have any other tips or hints for completing the Knife Flights? Please post them in the comments below.